On May 24th we're taking back Chardonnay. If there's a sin to be laid at the feet of the commercially-minded California wine world, aside from the creation of White Zinfandel, it's the destruction of Chardonnay as it was intended to be. Chardonnay came from France, a beautiful wine with lots of acidity, minerality and when made well, an accent of oak that brought the wine a roundness and depth. Now, don't get me wrong, there are some nice Chardonnays that come from California, with serious acidity and ageability, Hanzell for example. But sadly California's Chardonnay reputation is not built on the Hanzells and the Rameys it produces, it's built on the wines masquerading as butter scotch syrup, it's the Cougar-Juice, it's the Rombauer that is what American Chardonnay has come to be known as. Cougar Juice refers to the style of Chardonnay so over oaked that it seema the grapes were crushed with a Louisville Slugger and then sent into an oak barrel only to be bottled once again in an oak bottle. The toasty, nutty, buttery and creamy characteristics and any semblance of the once elegant Chardonnay have been beaten to a pulp. You seek out the fruit and you cannot find it, for the life of you you cannot find its aromatics or its flavors, all you can find is wood. Frankly, if you swirl the wine too vigorously you could end up with splinters in your tongue. Plain and simple, this is wrong. Wrong. The Chardonnay grape is one of the noblest of varietals, hailing from Burgundy, and it has the power to be a transformative wine experience. I can personally say that perhaps the greatest wine I've ever had was a Chardonnay, a Burgundy, the Grand Cru Corton Charlemagne. A wine with such depth of character and complexity, balance and aromatics that it was nearly a religious experience. Why would anyone ever want to sully such beauty with such unbridled use of wood? On 5/24 we're taking Chardonnay back, taking it back from the Cougars and back from the Californicators who did such damage to its noble beauty. Luckily for all of us there are those in the Northwest who are well aware of the beauty and potential of Chardonnay and are producing wines that are reminiscent of those origins. Both Chardonnays fermented in stainless steel a la Chablis, with a crispness and acidity that soars, as well as those done in oak, striving for balance, roundness and preservation of fruit. On May 24th a variety of those wines will be unleashed upon Seattle at West Seattle's Bin 41. And that will make the world a better place. From 6 to 8pm Chardonnay lovers or those new to the varietal can pariticpate in International #ChardDay a Twitter virtual tasting from Rick Bakas. Bin 41 will be pouring 2 Washington Chardonnays, Maison Bleue and the steel fermented Lecole 41, from Oregon the typically winery only Crowley Four Winds Chardonnay and Amalie Robert, as well as a Chablis from Burgundy's Albert Bichot and a barrel fermented Burgundy surprise. $5 to taste them all and it's refundable with a purchase of one of the featured wines. If you love Chardonnay the way it's meant to be and you want to end the reign of the Cougars you need to get to West Seattle this Thursday. Interested to hear how the Crowley is. My favorite OR Chards as of late are Bergstrom Old Stones and Stoller. 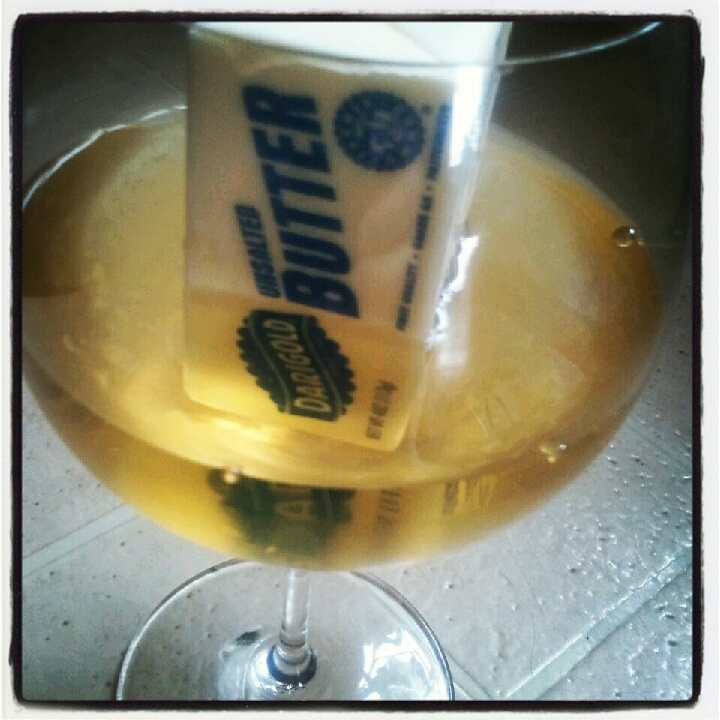 Love the picture with butter floating in the wine. I am a huge fan of the stoller chards but the four winds Crowley chardonnay knocked my socks off. you should definitely try to make it to the tasting. Thanks for all of your promoting of #Chardday and your support of our Wine Shop "Bin 41". We truly appreciate it and we are grateful to have such strong supporters. Thanks and let's do it again!! I think Pinot Noir is Next! Happy to be a part of it Jon and T. We love the shop and you guys are buena gente. Sounds like 9/6 for #PinotSmackdown.